The name of this old building has changed a few times and the floor plan has too, but basically it is just as it was when purchased in 1906 by Sue’s great grandparents, along with the house next door (where Sue grew up) and 300 plus acres of land for $800! 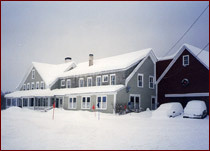 The Lodge was built in the 1860’s and has served the public for most of those years. 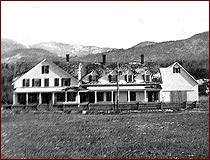 Sue and Chet have the guest registers from 1906 on – perhaps you know someone who stayed here. There are 12 bedrooms, 9 used by today’s guests. Chet and Sue also live here and occupy 2 of the rooms. The bedrooms are not pretentious by any means, but are comfortable and clean. They share two full baths and a half bath. All bedrooms are on the second floor. The first floor belongs to all. The dining room is bright and large. The fireplace room is a welcome retreat on a cold winter’s day and the parlor on the north end has been made more comfortable with the addition of a gas-fired stove. This room also has a TV with satellite dish antenna. In the warmer months, the front porch facing west becomes the favorite spot to sit, or even enjoy a meal. All are welcome to pass through, and even linger in the spacious kitchen facing Cannon and Kinsman Mountains. The wood stove beckons in the winter. Perhaps one of our greatest compliments, "It’s like coming to Aunt Sue’s and Uncle Chet’s house", sums up the atmosphere. Children are welcome, as are your pets, well mannered we’re sure. We would like to know in advance if you plan to bring Fido and/or Whiskers. We provide free hi-speed wireless internet access via satellite. We have hosted two wedding receptions, a farewell party, a wedding rehearsal dinner and a family reunion for which the whole house was rented. Our back yard can accommodate a tent up to 40 x 100 feet and the kitchen may be used by a caterer. Please contact us for more information about whole house rental. "Gloria and I and all the folks from 'Adirondack Ottawa' outings group who stayed at Kinsman Lodge recently, wish to thank you again for your warm and gracious hospitality bestowed on us throughout the course of our visit.